Spyware are small programs that run in the background on your PC. They 'hide' themselves from the user and perform tasks that typically invade your privacy, they do literally 'spy' on you, and can make it difficult for you to find and remove them. These spyware programs come bundled with free downloadable programs from the internet (such as Kazaa, Imesh even Cuteftp). The reason these programs are free to you is because advertising companies pay the developer of the program to put their spyware within it. The main purpose of Adoko is to make people aware this is happening, and help them remove such Software. We are highly against this type of advertising. Some spyware programs display pop-up adverts every so often to interfere with your browsing (as if there isn't enough site which already display pop-up ads), know what programs you are running. Others are most serious, they can log everything you type (keyloggers) the send the results to a company without you knowing. Yes, this means they can read all you private emails, what sites you visit, and know your passwords. Most of these spyware programs are badly written, let's face it, they don't care about you or your computer, as long as they get the information they want off you. therefore, they can cause your computer to crash regularly or weaken your security, thus making it easier for hackers to attack your computer. Which programs does it come with? Could be anything that you download for free, and most common place at the moment is file-sharing applications. Spyware now comes with about 900 different applications (including Kazaa, Bearshare, Real Player, Cuteftp) and the number is always rising. SpywareGuide.com is a great site which tells you if the program contains Spyware. Try the box below! How can I remove spyware from my Computer? An easy way to remove malware is to use a program called Ad-aware or/and SpyBot Search and Destroy. I recommend using them both for detecting and removing Spyware. However, SpyBot is much more powerful you can check running processes, start-up programs etc. 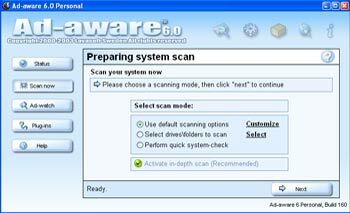 After you've installed Ad-aware scan your system to check if you have any spyware. The main concern are components found in the 'Registry keys'. It depends some do, some don't. You have to ask yourself, do you really want to use such programs that need this spyware to function? I know for definite that Kazaa will not work after, so if you can't live without it don't run ad-aware. You would have thought that uninstalling the orginial program would remove the Spyware it came with. In some cases it will - but you can't be sure, as I said, these people are scum and they want to steal any information they can get off you, it's worth money to them, that's all that matters. So programming a proper uninstall for their own Spyware software is not in their interest, so don't count on it. Run Ad-aware or a similar program to be sure. 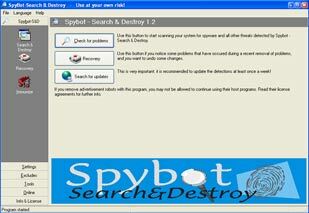 Spybot Search & Destroy - The best application to remove Spyware componants on your system (and it's free!). This program also has so many useful added features. Ad-aware - Another good free program to remove spyware on your system. Scumware.com - Very good page for general information about Spyware, with some useful information on how to manually remove some of the worst spyware. Removing Newdotnet - Very informative page about removing newdotnet - the scum of spyware.